A billionaire, in countries that use the short scale number naming system, is a person with a net worth of at least one billion units of a given currency, usually major currencies such as the United States dollar. In 2016, the highest geographical concentration of billionaires was in Asia-Pacific region and in the United States. With 609 individuals worth more than one billion U.S. dollars in 2017, China was the country with the biggest billionaire population worldwide. Its capital, Beijing, alone had 94 billionaire residents, and it was the city with the most billionaires in 2017. In 2015, most billionaires were self-made. The total net worth of the ten richest billionaires worldwide was estimated to be at over 505 billion U.S. dollars in 2016. Bill Gates, the richest man in the world, had a fortune of 75 billion dollars. Second on the list that year was Amancio Ortega, founder of Spanish clothing chain Zara. Ortega’s net worth amounted to 67 billion U.S. dollars in 2016. American business magnate and investor, Warren Buffett, worth about 61 billion dollars, ranked third. When taking a closer look at the demographics of billionaires globally, about 87 percent were men in 2013. The world region with the highest female billionaire share was Europe, at 17 percent. In 2015, Angola was the only country with a 100 percent female billionaire population. 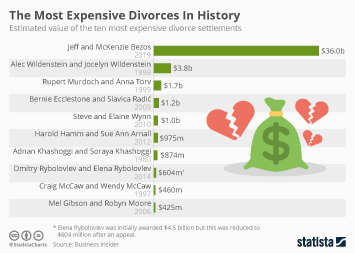 According to 2015 data, over 85 percent of billionaires were married, and only 4 percent of billionaires stated their relationship status was single. When it comes to the attained education level of billionaires, more than 70 percent had a Bachelor’s degree and about 22 percent had earned a Master’s degree in 2015.